If you love to shoot photos and videos in parties, functions, travelling, hang out with family or friends, If you want to capture every moment of your life without spending too much on a camera, probably you are looking for a point and shoot camera with best features in minimum price. There are hundreds of point and shoot cameras in the market and it would be kind of tedious work for you to choose the one out of many. Here we have 5 best camera suggestions under 5K INR price tag with many features you would love to explore without burning a hole in your pocket. Weighing 171 grams, Nikon Coolpix L25 comes with 10.1 MP optical CCD sensor with ability of 5X optical zoom and 4X digital zoom. It has 3 inch LCD display and runs on Lithium ion battery or alkaline batteries as well. The camera shoots photos at a resolution of 3648 x 2736 pixels and 720p HD videos in AVI format. 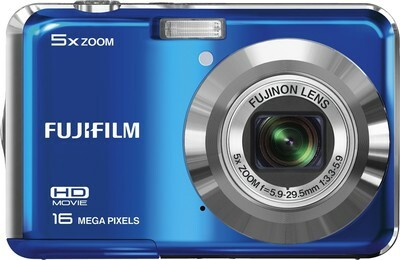 The camera has 20MB internal memory expandable via SD card and has option of transferring data to computer via USB cable. Camera flash has a range of 4.2m and comes with aperture range of f/2.7 – 6.8, iso sensitivity range 80-1600. Other features includes 21 shooting modes, continuous shots (4 images at 1.2fps), 28mm wide-angle picture mode, macro range 3 cm, red-eye reduction, face detection and self timer. 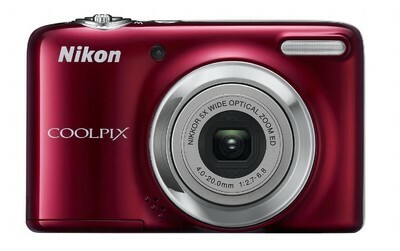 The camera is available at a price of 4355 INR with 2 year warranty and comes in red and silver color. Weighing just 119 gram without battery, Fujifilm AX550 comes in silver, black, red and blue colors. AX550 has 16 MP CCD optical sensor with ability of 5X optical zoom and 7.2X digital zoom. Camera has 2.7 inch LCD display which can display video with Full HD resolution which is impressive. The camera runs on lithium-ion rechargeable battery or AA size alkaline batteries. The camera can shoot at 720p HD resolution and supports SD card for memory and supports USB cable for media transfer. The camera has f/3.3 – f/5.9 aperture with flash range 0.6- 3 m and ISO sensitivity level 64-3200 which is commendable at this price range. Other features are continuous shots, macro mode (10-60 cm), self timer, face detection, red-eye reduction and 21 shooting modes. The camera has price tag of 4400 INR with 2 year warranty. 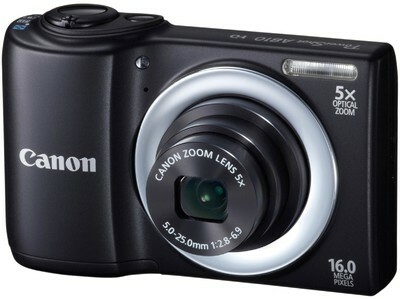 Weighing 126 gram without battery Canon PowerShot A810 comes in silver, black and red colors. It has 16 MP CCD sensor and zooming ability 5x optical and 4x digital. Camera has 2.7 inch TFT LCD screen which can display video at resolution of 720 X 1280 pixel HD. The camera only supports AA size alkaline batteries. The camera can shoot 720p HD videos and has SD card support for storage expansion and supports USB cable for transferring media. It has f/2.8 – f/6.9 aperture size, auto flash with .5-3 m range, ISO sensitivity level 100-1600. Other features include self timer, face detection, auto scene selection (32 modes), macro mode(3-60 cm), 28 mm wide-angle lens, white balancing and red-eye reduction. The camera is available at 4900 INR with 2 year warranty by Canon. 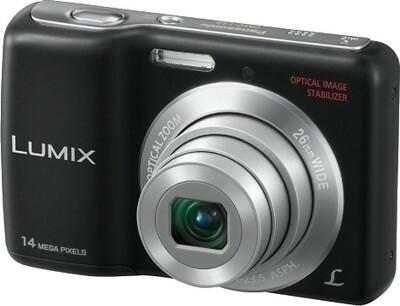 Weighing 125 grams without battery,Panasonic Lumix DMC-LS6 comes in black and silver color options. It has 14.1 MP CCD optical sensor and 5X optical and 4X digital zoom. The camera has 2.7 inch TFT LCD display that can display 720 X 1280 HD resolution videos at 30 fps. It supports AA size alkaline batteries.Camera can shoot 720p HD videos and has 10 MB internal memory expandable via SD card, it supports USB cable for media transfer. It has f/2.8 – f/6.5 aperture size, auto flash with range 0.6-4.6 m, ISO sensitivity level 100-1600. Other features are face detection, self timer, shooting modes, 28 mm wide-angle picture, red-eye reduction, continuous shots and white balancing. The camera is available at 4800 INR with a 3 year warranty from Panasonic India. Weighing just 95 grams without battery, Panasonic Lumix DMC-S2 comes in 2 color options black and violet. It has 14.1 MP CCD image sensor with 4X optical and 4X digital zoom. Camera has 2.7 inch LCD display that can display HD videos (720 X 1280 pixels) at 30 fps. It comes with 680 mAh rechargeable battery. Camera can shoot HD videos and has 70 MB internal memory and expandable option via SD card and USB cable for media transfer. Camera has f/3.1 – f/6.5 aperture size, auto flash with range 0.4-3.3 m, ISO sensitivity level 100-6400. Other features are self timer, various shooting modes, red-eye reduction, continuous shooting at 1.5 fps and various white balancing options. 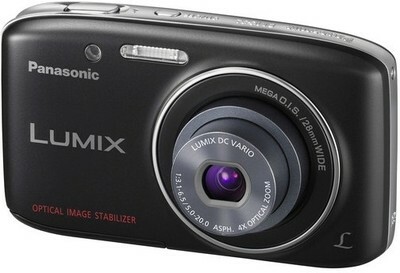 The camera is available at 4990 INR with 3 year Panasonic India warranty. SEE ALSO: How Many Photos Have Ever Been Taken?